For several years, Dubuffet had abandoned the war-scarred and melancholy Paris and worked in the countryside producing textural works that took a microscope to Nature. However when he returned to the French capital in 1961 he found a city completely different to the one he had left. Optimism and cosmopolitan bustle had replaced the gloom and despondency that had formerly prevailed. This new vibrant atmosphere was intoxicating for Dubuffet and had an immediate and explosive effect on his work, especially in the exuberant Paris Circus pictures, which today rank amongst his most acclaimed and sought-after works. Where formerly, for instance in his Texturologies, nature had been the source of his investigations and inspiration, now city life itself came to dominate his paintings. Where he had formerly celebrated life on a minute scale, he now celebrated humanity on a monumental scale. Paris-Montparnasse, painted in 1961, is amongst the largest of Dubuffet's Paris Circus paintings, and one of his most successful. There is something positively Parisian in the crowds of people. The picture buzzes with life and movement, the chaos of the vehicles perfectly distilled into the work. Each car appears to be a little world unto itself, and yet almost all of the characters face the viewer creating a strange and striking interaction. 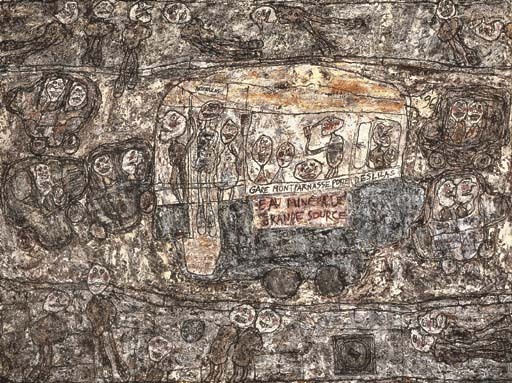 While this is in part reminiscent of children's art, as is the strange squat-map bird's-eye angle from which he has depicted the street, Dubuffet was in fact trying less to imitate the art of children than to reclaim the raw and unfettered vision that the psychotic manage to condense onto paper and canvas in their art. Styles and schools hamper and train our artistic understandings of the world, but here Dubuffet has tapped into the unrefined vitality that is lost through teaching and discipline. His early, pre-War works tended to be influenced by artists like Suzanne Valadon, but now he managed to 'unteach' himself everything that he had learnt and in so doing to rediscover a potent and unrestrained vision of the world. In Paris Montparnasse, he has translated this vision onto canvas. Despite the child-like reduction and simplification of the human forms in this painting, the density of detail and activity is itself incredible. Each character tells a tale, is involved in his or her own arcane and hieratic act. The cars appear as little bubbles filled with people, as does the bus in which we even see the ticket inspector. Even the heads of the individuals appear as bubbles, disproportionate and child-like, each wide open face conversely a closed and concealed world in itself. Dubuffet's interest in sound and music, which he especially developed over the next two years, seems to intrude Paris Montparnasse--the sounds of the traffic, the klaxons and the engines, seem almost palpable. The sheer density of life in this work is emphasised by the density of impasto. Where Dubuffet had recently been using such textures to instill a sense of soil and nature, here he has scratched and sculpted his paint to form the figures and details of the Paris street. The dense mix of almost dirty colors in Paris Montparnasse is peculiarly suited to the subject matter-the greys and browns recall the exhaust fumes and pollution of the city, adding an ungarnished air of subjective reality to the work. Despite his lengthy sojourn in the clean air of the country, Dubuffet does not seemed repelled by this Parisian pollution. Instead, he presents it in the same colors and tones that he had used when painting natural subjects. Even the smoke of the city sends him reeling joyously while the Parisians within the picture, almost all presented with rosy cheeks, even appear to thrive on it. Dubuffet has used the impastoed layers of many-colored oils in part to make a human presence absolutely unambiguous- human presence is obvious in the traces of Dubuffet's real physical effort in painting the work, but also extends to the depicted figures. There is a heady concentration of humanity in Paris Montparnasse. Comparing his 1961 Paris Circus works to the previous, more impersonal output, Dubuffet said that, 'In reaction against this absenteeist tendency my paintings of this year put into play in all respects a very different intervention. The presence in them of the painter now is constant, even exaggerated. They are full of personages, and this time their role is played with spirit' (Dubuffet, letter to the author, 21 December 1961, quoted in P. Selz, The Work of Jean Dubuffet, New York, 1962, p. 165). Of the Paris Circus works, Paris Montparnasse ranks as one of the five largest. Of these, Le commerce prospre is in New York's Museum of Modern Art, Le plomb dans l'aile is in the Detroit Institute and Rue Pfifre is in the Fukuoka Museum. Paris Montparnasse is thus one of the last true monumental Paris Circus scenes to remain in private hands.